How many ethical companies can you think of? I know about one company that searches globally for local farmers and food producers, checks whether the foods are organic, environmentally sustainable and pure. It also seeks to make sure that it’s investment will support the local community where the food is grown. They have a singular commitment to quality, are are always on the lookout for new foods. 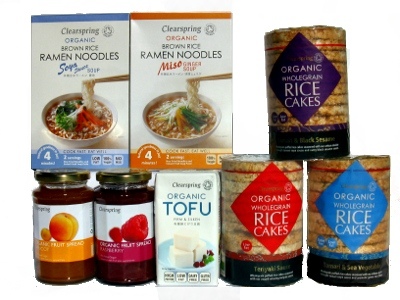 To celebrate Clearspring’s amazing standard and innovation I’ve got a lovely box of their vegan products to give away (and a special offer for everyone who enters). So, if you’d like to be in with a chance to win send an email with the subject Clearspring Box and include your address details (UK addresses only, competition closes 24.2.11). The box will include their new organic corn cakes, rice cakes (black sesame, sea vegetable and teriyaki flavour), instant miso and soya sauce noodles, the world’s first ambient organic tofu and their fruit spreads (apricot, blueberry, cherry, raspberry and apricot). Next > How would you like to be paid £200 a year for your hot water ?